January 19, 2012 was a sad day in the story of photography indeed for it was on that day that Kodak, a company founded by George Eastman back in 1888, filed for bankruptcy. It was on that day that the company that almost completely defined and created a new market of amateur photography shut down its doors. Never again will a birth, a graduation, a wedding, or a vacation be captured as a "Kodak Moment." Kodak was born in 1888 with the introduction of the Kodak #1 camera. Invented and marketed by George Eastman (1854–1932), a former bank clerk from Rochester, New York. 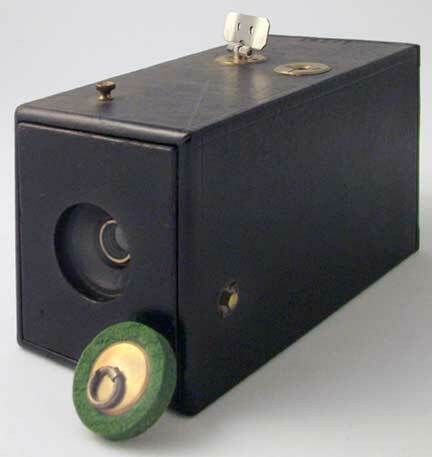 The Kodak #1 was a simple box camera that came loaded with a 100-exposure roll of film. When the roll was finished, the entire machine was sent back to the factory in Rochester, where it was reloaded and returned to the customer while the first roll was being processed. Eastman's real genius, however, was not in the creation of the box but in his marketing strategy. By simplifying the apparatus and even processing the film for the consumer, he made photography accessible to millions of casual amateurs with no particular professional training, technical expertise, or aesthetic credentials. To underscore the ease of the Kodak system, Eastman launched an advertising campaign featuring women and children operating the camera, and coined the memorable slogan: "You press the button, we do the rest." Kodak continued its leadership of the photography industry for over a century. 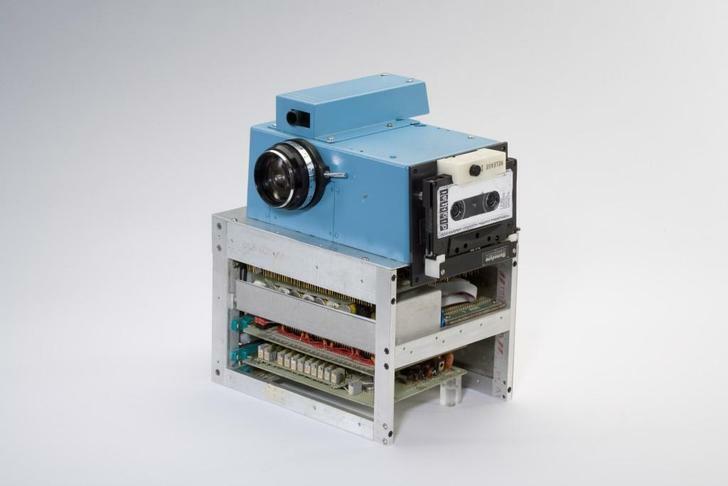 In 1975, Kodak unveiled the first digital camera to the world. Weighing in at around eight pounds and about the size of a toaster, the hefty device was the brainchild of Kodak engineer Steve Sasson and his team from the Kodak Apparatus Division Research Laboratory. Over the years, since 1975, Kodak amassed more than 1,000 digital-imaging patents upon which almost all modern digital cameras rely. So, if Kodak pioneered the market for amateur photography and invented the first digital camera, why then is it the company that ultimately filed for bankruptcy while companies such as Canon, Nikon, Pentax, Sony, and many others are thriving in this very lucrative digital amateur photography market? While Kodak's demise is a complex tale consisting of many contributing factors, the root cause can be traced to a strong reluctance to alter the status quo. From the very beginning, bewildered Kodak executives could not (or did not want to) understand why anyone would ever want to look at images on a TV screen. Considering that Eastman's Kodak #1 camera turned photography into a hobby for the masses way back in the 1890s, it is sad that although Kodak actually invented the "next big thing", it did not market it "seriously" enough, letting Japanese rivals dictate, drive, and ultimately own the lucrative digital-camera market. Rather than embracing the future, Kodak executives wasted their precious time and energy in trying to preserve their profitable business model of cheap cameras and expensive film. By the time they realized their mistake, it was just too late. Interestingly enough, another iconic company that played a similar role in bringing personal computing to the masses is also going through a similar market situation. Microsoft has been a dominant player in the personal computer operating system market ever since co-founder Bill Gates won the contract to build the first operating system for IBM Corp.'s personal computer in the early 1980s. As I write this blog, Microsoft is putting the finishing touches on Windows 8 - perhaps the most important piece of software that it has written since that historic moment in the 1980s. Microsoft designed Windows 8 to help it perform a difficult balancing act. Just as Kodak tried to with its expensive camera films, Microsoft hopes to keep milking revenue from a PC market that appears to be past its prime, while trying to gain a stronger foothold in the more fertile field of mobile devices. It's a booming market that, so far, has been defined and dominated by Apple Inc.'s trend-setting iPhone and iPad, and Google Inc.'s ubiquitous Android software. Will Microsoft be able to do what Kodak wasn't by having its cake and eating it too? The bottom line - Status Quo is the Enemy of Innovation. Kodak's demise was a direct result of its lack of willingness to "go where no man had gone before. "* It was a company that got too wrapped up in "preserving its present" (revenues/profits from its sales of expensive film) rather than "creating and accepting a future" in which there would be no film. Kodak tried to survive by ignoring and stalling the future. Paradoxically, the future came anyway and just ignored Kodak! * Principle #3 in my book "Living in the Innovation Age." I discuss many similar examples throughout the book about companies who faltered by not challenging the status quo and conversely companies that have continued their leadership by challenging existing constraints or imposing new constraints that spur innovation. I just came across a definitive global ranking of management thinkers that is published every two years based on voting at the Thinkers50 website and input from a team of advisers led by Stuart Crainer and Des Dearlove. The Thinkers50 has ten established criteria by which thinkers are evaluated: originality of ideas; practicality of ideas; presentation style; written communication; loyalty of followers; business sense; international outlook; rigor of research; impact of ideas and the elusive guru factor. Not surprisingly, 2011's winner is Clayton Christensen of "disruptive innovation" fame. The 2009 winner was the late C. K. Prahalad, who co-authored a favorite book of mine "The New Age of Innovation" with M. S. Krishnan. I have reproduced the listing* below with yellow highlights on the business thinkers that I actively follow. The "Innovative" Company - Is it just a figment of one's imagination? Fast Company just released their list of 2012's 50 most innovative companies. One company that immediately jumped out for me was Netflix - not because it is on the list but rather because it is NOT on the list! Netflix was #12 on the top 50 most innovative companies in 2010. It then advanced to #8 in 2011 for streaming itself into a $9 billion powerhouse and crushing Blockbuster along the way. Now, it's completely out of the top 50! Those of you who have read my recently published book, Living in the Innovation Age, might not be surprised by this as this is exactly the discussion that Chapter 1 begins with - just as Netflix displaced Blockbuster by changing the rules of the "movie rental" game so too is it being displaced by others who are now changing the rules on Netflix! The reason that I brought up Fast Company's list of the top 50 most innovative companies is that most of us would love to see our company mentioned among this esteemed group. After all, who doesn't want to be part of leading an "innovative" company? But is there such a thing as an "innovative" company? Or is it just a figment of our imagination much like how a damsel in distress might dream about her "knight in shining armor?" One of the principles of innovation I discuss in my book is that "Innovation is a Journey Not a Destination." As I explain the principle, I refer to the "impedance mismatch" between what typically sustains organizations (whose natural tendency is to seek efficiencies) and what it must do to innovate (promote an environment that is tolerant of mistakes and potential inefficiencies in the short term). Given the natural "efficiency-oriented" mindset of organizations, "innovativeness" is an unnatural state of existence. As we all know from our study of science, all elements in nature strive to exist in their steady state, which for organizations is the state of minimal errors and risk. Clayton Christensen asserts that a single organization can't house two competing systems; companies seeking to drive disruptive growth therefore need to create spin-off organizations. Vijay Govindarajan and Chris Trimble suggest that companies can consciously manage the balance between the "performance engine" (that minimizes mistakes) and the "discovery team" (that encourages experiments) by being clear about what core capabilities should be forgotten and borrowed. Each of the above theories highlights the importance of not allowing the efficiency-oriented culture of an organization to smother to death the innovative tendencies of the fledgling few. The bottom line - Innovative companies can exist in nature but only in tightly controlled and managed environments that allow an open sharing of ideas, collaborative learning, and a culture where taking risks and making mistakes is not only tolerated but encouraged. With out these precursors, innovative companies can only exist in one's imagination. I came across an interesting blog today on HBR titled “Wanted: Idea Fusers” by Bronwyn Fryer. The blog starts off quite simply with a well known and proven concept that "great innovation springs from the ability to pull two unlike things together to create a beautiful third.” Of course, her premise is supported by how Steve Jobs famously shifted a paradigm by “fusing” calligraphy with technology to create the Mac's legendary graphical user interface. In fact, that is exactly what Chapter 8 of my book, Living in the Innovation Age, is all about. Titled “Leveraging the Medici Effect”, the chapter talks about the importance of leveraging the ideas, background, and experiences of a diverse group of people (employees, customers, and partners). The Medici effect refers to the popular theory that the Renaissance Age began in Florence, Tuscany in the 14th century primarily because of Florence's affluent Medici family. Historians who back this theory contend that the Medici family acted as the catalyst for innovation during the Renaissance by bringing together people from vastly different professions and cultural backgrounds. This enabled a unique exchange and confluence of ideas that had never been possible before. California’s Silicon Valley, a hub for entrepreneurship and innovation, is often considered a modern example of the Medici effect because many credit its success to the cultural diversity in a small concentrated area. The fact is that organizations, too, can leverage the Medici effect by providing a safe and unencumbered environment that encourages the free exchange of ideas and promotes collaboration between people with different skills, competencies, and backgrounds. In my book, I discuss four specific techniques that can help organizations leverage the Medici effect to spur innovation in their environment. One point that Bronwyn makes in her blog a bit more clearly than I did in my chapter is the importance of truly practicing "hiring diversity." She provides examples of companies such as IDEO and Jump Associates that get paid big money for their ability to spur innovation through associative thinking. Both IDEO and Jump practice "hiring diversity" in which they hire people who are a "mile wide and inch deep." In other words, they prefer generalists over specialists. Bronwyn concludes her blog by challenging us to take a good look at the people we typically hire. Does our "diversity policy" only apply to people of different genders and races? To innovate, we need more diversity than that - we need intellectual diversity that can help us combine unlike ideas together in new ways much like what happened back in the Renaissance Age, the Silicon Valley, and Steve Jobs' MAC's graphical user interface. The bottom line - Innovation Thrives on Diversity and Generalization not Homogeneity and Specialization. Social Media - A life saving innovation that's more than just a toy! In my recent book, Living in the Innovation Age, I discussed how Social Media tools such as Twitter and Facebook have been used with great success in the non profit sector to save countless lives in the face of natural disasters such as earthquakes. For example, last year when Japan was hit by massive earthquakes, both Twitter and Google’s online Person Finder tool gave aid organizations a method to gather information about the disaster and correct any misinformation on the Web. disaster struck areas such as Haiti and Chile. The origins of Ushahidi can be traced back to 2008, while Kenyan blogger Ory Okolloh was covering the post-election violence in Kenya and she blogged, "Any techies out there willing to do a mash up of where the violence and destruction is occurring using Google Maps?" Within days, two such techies wrote software code for an open-source, Web-based platform that would come to be known as Ushahidi, which means “testimony” in Swahili. Ushahidi provides volunteers information collected from a variety of sources that include text messages, blog posts, videos, phone calls, and pictures, all mapped in near real time. Over 10,000 Haitian-American volunteers across the United States translated every text message from Creole to English within 10 minutes. The result of this innovation has been nothing short of spectacular with countless precious lives saved. Now, it seems that we have yet another convert. The Federal Emergency Management Agency (FEMA) is also using information gathered from social media monitoring to help improve its effectiveness in responding to natural disasters. On February 3, 2012 at an event hosted by the State Department called Tech@State, FEMA Administrator Craig Fugate conceded that "While official assessments are more thorough, speed is more important than precision." He likened disasters to horseshoes, hand grenades and thermo nuclear devices in which you just have to be close. In his words "You won't get that time back...speed in response is the most perishable commodity in a disaster." Over the past few years FEMA has been heavily citicized especially following its sluggish response following Hurricane Katrina. Many have claimed that FEMA failed miserably because it spent the precious first 12 to 24 hours after the disaster getting teams into the area to make an assessment and send information back to headquarters rather than taking the desperately needed life-saving action. Compare and constrast that to how FEMA responded when tornadoes ripped through Joplin, Missouri in May 2011 in which FEMA correctly realized that it had enough information, even if it was imperfect, from Twitter and Facebook to suggest that the situation was dire and immediately start taking remediating action. The bottom line is that social media is becoming an increasingly important way for aid organizations to quickly assess, mobilize appropriate resources, and rapidly respond to disasters helping them save countless lives. Innovation Seeks to be Free, so states Principle #4 in my recently published book, Living in the Innovation Age. And as I further elaborate in my book, “crowdsourcing,” is an example of one such innovation trend that exhibits the three requisite characteristics of being free – Openness, Participatory, and Collaborative. Crowdsourcing refers to the outsourcing of tasks that are typical performed inside an organization by employees or contractors to an unspecified, large group i.e. the crowd. I cite several examples of successful crowdsourcing projects in my book including former Federal CIO Vivek Kundra’s “Apps for Democracy” and DARPA’s next-generation combat support vehicle (XC2V) prototype contests. Now it appears that the concept of crowdsourcing is really catching on beyond what one normally might consider the realm of innovation. Just yesterday Rita McGrath blogged on HBR about how employers are using the concept of crowdsourcing to acquire skills to get even traditional jobs done. As an example, she cites an article in the Wall Street Journal that described how AOL has been doing just that. Although this appears strikingly similar to traditional outsourcing, it’s actually not since the employer doesn't need to make any commitments at all – not even to a temporary project team, much less to permanent employees. So, why the sudden interest in crowdsourcing? The bottom line is that in today’s roller coaster economy access to assets trumps ownership of assets. As it turns out, crowdsourcing makes gaining cost competitive and flexible access to critical assets easier than ever before.